It is wholly ironic that I am writing a post about my love for a leafy green vegetable given how I never ate anything green as a child. Today, I can't get enough green in my life. My love for kale began, strangely enough, in Vancouver when my husband and I ate at the famous Indian restaurant Vij's. 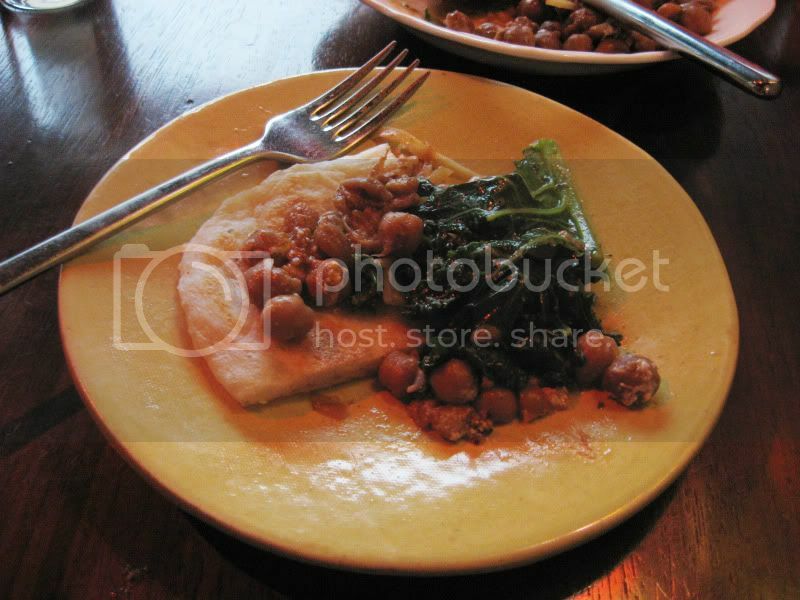 We ordered an appetizer there that included garbanzo beans and grilled kale. I'm not lying when I tell you that the grilled kale tasted exactly like steak. I was so enamored with this dish, that I asked the waitress how it was cooked, and she happily told us that it's marinated in lemon juice and coconut milk. I have been making grilled kale marinated in lemon juice and coconut milk every summer since and it is just as good as I had it at Vij's. But let me back up a little bit and go back to this "tastes like steak" thing because I think this is where my love for kale really developed. I have become very conscious in the past few years of my meat intake. I will never fully give up meat because I love it too much, but I also recognize the need to be kinder the planet by not consuming so much of it. So I have begun a quest in my own kitchen to create textures and flavors that are equally as satisfying. Many people run right for the mushrooms when attempting to recreate a meaty texture, but I go for the kale. Despite its leafy green categorization, it's extremely hearty and stands up to anything you do to it. I have become a tad obsessed with finding places to add it in just about anything I cook for dinner. Earlier in the week I added it to mac and cheese, and the night before last I threw in a couple handfuls to my chicken noodle soup (and then made kale chips with the other couple handfuls). So if you're someone who thinks kale is just that garnish restaurants put on the side of the plate that you can throw away, I challenge you to start thinking of ways to add it to your diet. You'll be surprised at how delicious (and meaty) it is! Incidentally, I have tried making kale chips many different times and always had problems with some turning out crispy while others were soggy. I found the best way to make kale chips is to cook them low and slow rather than high and fast. So toss them in a little olive oil and salt, put them on a baking sheet, and put them in the oven at 250 for 30 minutes and they'll come out perfectly crispy every time. ETA: For those of you interested in grilling kale, I did a post about it a few summers ago but here is the link again. The recipe comes from the Vij's cookbook. How interesting - who would have thought kale could taste like steak? Frankly, I never tried it much but you've got me thinking about it now! It only really tastes like steak if you marinate it and grill it, but it does have a meaty texture no matter how you cook it. I too adore kale. Well, all greens. We currently on a broccoli rabe kick -- can't get enough of it. I too discovered the slow method of kale chips, and it does work better that way. Now be sure to share that grilled kale recipe in the future. I want to know how to do it. I think I need to up my greens..but I always put them in chicken soup. Can you believe I've never had Kale? I don't cook a lot of greens in my home because of food allergies (hub's), but I definitely need to try them. Kale chips sound really interesting. My daughter-in-law is also crazy about this green. She grows beautiful patches of it and will break off a little piece and eat it right in the garden. I've tried but raw is not for me. I like it best added to vegetable soups or cooked down with bacon and white beans. I, too, am not a fan of raw kale. It needs to be cooked in some way for me to want to eat it. I know kale is very very good for us but I just can't like it! Sorry! 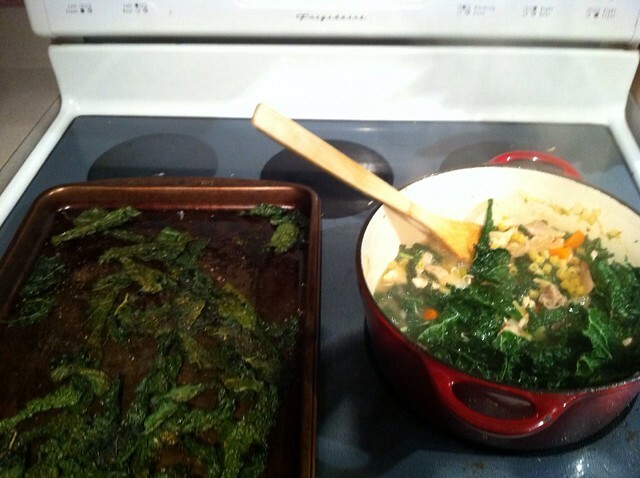 I need to start cooking with kale - have only used it once, and that was in a soup recipe. Kale chips are so good! Kale is the best! I spent the first half of my life without kale, and the second half of my life (at this point) with kale as my go to green. I love it in matzoh ball soup, in stir fry, and sauteed with a little garlic and soy sauce. Yum. We eat a lot of kale (and other dark leafy greens) in my house since we get it very often in our organic co-op. I agree with your method of baking kale chips on a low temperature for a long time. My kids didn't like them, but I did! I ate raw kale in salads a few times, but I wasn't crazy about it. The flavor was fine--it was just too tough to chew. Took a long time. LOL! I'm going to try the marinated kale because I am intrigued by what you are saying. My daughter snacks on nori all the time so I bet she would like kale chips. Thanks for the post! I like kale but haven't grilled it -- I'm going to try that. I enjoy growing it, but last year the caterpillars kept getting to it before I did! I've been wanting to try kale chips, thanks for the tip.